The SW wind was blowing like a banshee with white caps and a mud line near the shore. Water temp at Danville got up to 45F but who could fish in that wind. So....I began my quest of small tribs. There is much less water than last spring and fewer holes but I found 5 smallmouth all caught on the Baby Predator Craw. Included among them was a 3 pounder and this nice specimen that weighed in at 4 lbs 5 oz. The picture doesn't do her justice 'cause she was as wide as a pot-bellied pig. Way to find them and thanks for the report. I bet that wind was a bear today. Hopefully the spinnerbait bite is not far off! I have never mastered the art of spinnerbait fishing. Jigs and (hard) suspended jerkbaits have been my bread and butter. Im hoping with the rain moving in for sunday, and the warmer temps of the past few days. That tomorrow may be a decent day in the afternoon. Winds were pretty calm tonight, was a nice evening on the river. Was definitely odd with the air temps being so warm and the water being cold. First hole did not produce anything but 1 bite. Shot down to my honey hole, and started fishing about 715, by 8 my left hand smelled extremely fishy. Caught my first 1 at 720, then by 8 I had 8 landed. lost 3 or 4 more. If it resembled a crayfish, it was of interest. Most caught on crankbaits, but I did get 1 or 2 on spoons. Definitely laying along the current seams along the bank where I was. 2 were definitely had eggs in them. They looked like potbellied pigs. Dretallack - I'm going to have to hook up with you some day, if you don't mind. We tried the river last night at Marysville, I just can't figure out how to fish it. The current seems so fast. I tried tubes and kept snagging, was going to try for catfish but that was no better. Maybe this summer when the water is low and slow I'll make out better. In fact we might have been there when you were, I have an old green ford. Haven't seen anybody throw a spoon since my days fishing pike with a Daredevil in Canada. 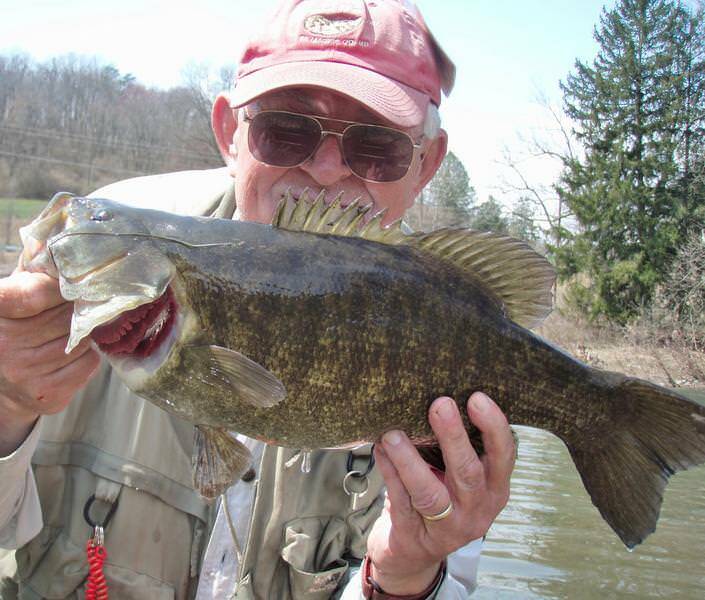 What kind of spoons do you use for smallmouth? I will start out with brewguy, thought that was you. Daughter hanging out with dad, mom playing board games with your son. I had no luck above you, also I was darning my winter beard still. Was just looking for some alone time, been pretty hectic the past couple of weeks. Dry, 1.5-2" eppindinger red daredevil. Until last year my spoons never caught a darn thing. Then in the early season, to be exact 4-15-17, I found out the smallies like them where I fished. Prior to the spawn, post spawn I did not catch a single fish on them for the rest of the year. So knowing tubes and catching fish on them, have never been easy for me. Last night was the same old same old, I went back to what works for me in the pre spawn. Rebel craws and reddevil spoons. I will say this as you have also said before Dry. My fish know my cranks and spoons, and know its was 225 days from last fish to first fish, so they wanted to come out and play again and say hi. Oh yes, one more thing brewguy, that channel you were fishing produces! When they are in there. I have done well in that very spot, especially early season. There is another channel I have done well in also, above the trees where I came from, but you have to wade out thru a eddie and know where to go. Or it is almost chest deep. You are where I was a couple of years ago, trying to figure this thing out. You grew up fishing the conewago creek, as both Dry and I did. I went back to using, what caught fish in my youth in the conewago, and then built upon it. We may be able to potentially hook up, but if you want to catch some really nice ones. Not every cast, this is the time of the year. If the water temps stay up, they will become more aggressive. Due to the need for energy for the spawning season. Keep you head up brewguy, make notes or keep a log of what works, it will help next year and following years. You will see patterns during different season and different heights of the river too. How far up there can you fish before you hit private/posted property? You should take your daughter over to wildwood lake, fish the canal, tons of fish in there. I have only ever walked up to that large eddy, just above the trees. That is where I usually enter the river, when I fish that area. It gives me the access to the current seams that I like. Snuck out tonight for a short while. Put the waders and rain jacket on for 1 purpose. Protection from the rain and wind, was only able to muster 30 minutes. Before the hot bowl of vegetable soup, and knowing the house was 70 degrees. Was also wishing I was fishing with Dry, because I might of been able to borrow a pair of his colorful gloves. The wind was howling straight up the river from the south, and it was 39 degrees. There was a hatch happening, because there were bank swallows every where. I had smallmouths porposing around where I was fishing too. Did manage to land 2 12"ers during that 30 minutes too. hopefully the rains this week don't cause the river to come up to much, and keep the temps in the 50's also. Sounds like a challenging half hour outing brother. And you still manage 2 Smallies.Great Job. Thirty years ago my brother and I discovered that smallies would attack spoons post spawn. we would catch them by the dozen but they were mostly smaller fish.